1 cup Gouda shredded cheese or any other Swiss cheese. Combine crepes ingredients in a bowl and whisk until all the lumps are out, and set aside for a 30 minutes. Heat a non-stick skillet over medium heat and spray with some olive oil. Use soup ladle to pour your crepes batter into the skillet tilting so you completely cover the bottom. It should be fairly thin, just eyeballing the amount of the batter. Once crepe has firmed up, and bottom is slightly browned, flip your crepe to another side for a few seconds and move it to the plate. Repeat until you have all your crepes made. Fry the chicken breast in the oil on both sides and cover the pan with a lid, for chicken to release the juice. Slice the onion and fresh mushrooms. Separately sauté the onion and mushrooms in butter over medium heat, until soft and lightly golden. Add the spinach or other herbs. Stir the spinach for a few minutes and put the lid on to let it wilt down. Remove chicken from the pan, cut into small pieces, and mix with the onion, mushrooms and spinach. Add flour to the chicken juice; add sour cream, butter and cheese. Mix thoroughly and put on a low heat for a couple minutes. If the sauce turns very thick, add some hot water or milk. 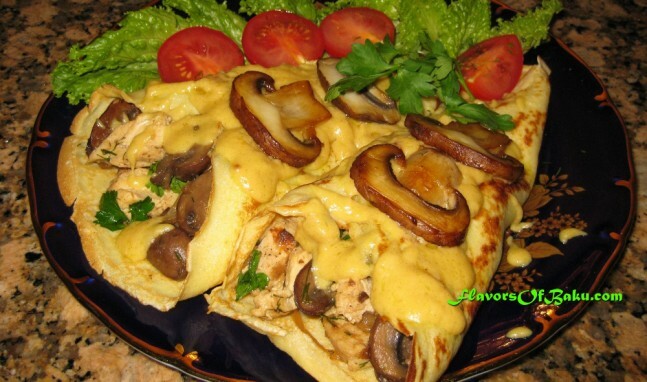 Place the stuffing on the crepes, wrap them, and pour the sauce over your crepes.